FILE - Israeli Prime Minister Benjamin Netanyahu, center, Republican U.S. Sen. Lindsey Graham, left, and U.S. Ambassador to Israel David Friedman, right, visit the border between Israel and Syria at the Israeli-held Golan Heights, March 11, 2019. The Trump administration says it will update U.S. government maps to reflect President Donald Trump's decision to recognize Israel's sovereignty over the Golan Heights. In a Wednesday email responding to questions from VOA Persian, a State Department spokesperson said the map changes would be "consistent" with a March 25 proclamation signed by Trump, saying the U.S. "recognizes that the Golan Heights are part of the State of Israel." 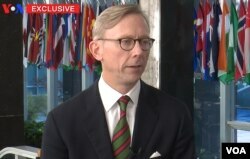 FILE - U.S. Special Representative for Iran Brian Hook speaks to VOA Persian, Dec. 18, 2018. In a separate interview with VOA later Wednesday, U.S. Special Representative for Iran Brian Hook said the State Department would "redraw" its official maps and release them "as soon as they are ready." The map changes will reflect facts on the ground and a "need for Israel to have secure and defensible borders," Hook added. In the earlier email to VOA, the State Department spokesperson declined to say whether the U.S. recognizes the Israeli border in the Golan Heights as being located along a 1974 cease-fire line on the western edge of a demilitarized zone patrolled by a U.N. Disengagement Observer Force (UNDOF). 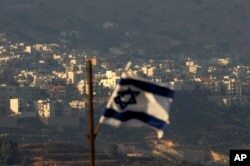 Israel considers the western line of the UNDOF zone, also known as line "Alpha," to be its border with Syria. Responding to a question about the Alpha line, the State Department spokesperson said: "The United States supports the goal of a secure and lasting peace between Israel and all its neighbors, including Syria. Such a peace should be achieved through direct discussions. Israel does not currently have a partner for peace in Syria." Deputy Israeli Ambassador to the U.S. Benjamin Krasna speaks to VOA Persian on the sidelines of Washington’s annual AIPAC conference of American pro-Israel activists, March 25, 2019. Syria has condemned the U.S. declaration on the Golan Heights. Responding to Trump's March 21 tweet announcing his intention to make the move, Syrian Ambassador to the U.N. Bashar Jaafari told reporters the next day that it was a "flagrant violation of international law, the charter of the United Nations, and the … values and ethics of international relations." The U.S. State Department's map of Israel already showing Jerusalem as the capital but the Golan Heights still as Israeli-occupied territory (screenshot of State Department map, taken March 27, 2019). The State Department's official map of Israel had yet to be changed as of Wednesday, still referring to the Golan Heights as "Israeli-occupied." It was not clear how long it would take for this and other maps to be updated. Official U.S. government maps of Israel also are displayed publicly on the CIA's World Factbook website and are available for download from the Library of Congress. The CIA World Factbook map of Israel is older than the State Department's online map, as it does not display Jerusalem as the capital of Israel, while the State Department's map does. Trump recognized Jerusalem as the Israeli capital in December 2017 and moved the U.S. Embassy there from Tel Aviv in May 2018. FILE - An Israeli flag flies near the village of Majdal Shams in the Golan Heights, Oct. 11, 2018. Republican lawmakers in the House and Senate introduced companion bills last month that would seek to codify a U.S. recognition of Israeli sovereignty over the Golan Heights, a move they say would prevent a future U.S. president from undoing Trump's declaration. In its email to VOA, the State Department spokesperson said the Trump administration had not taken a position on any Golan Heights legislation "at this time." "Legislation is not required to give effect to the president's decision," the spokesperson said.